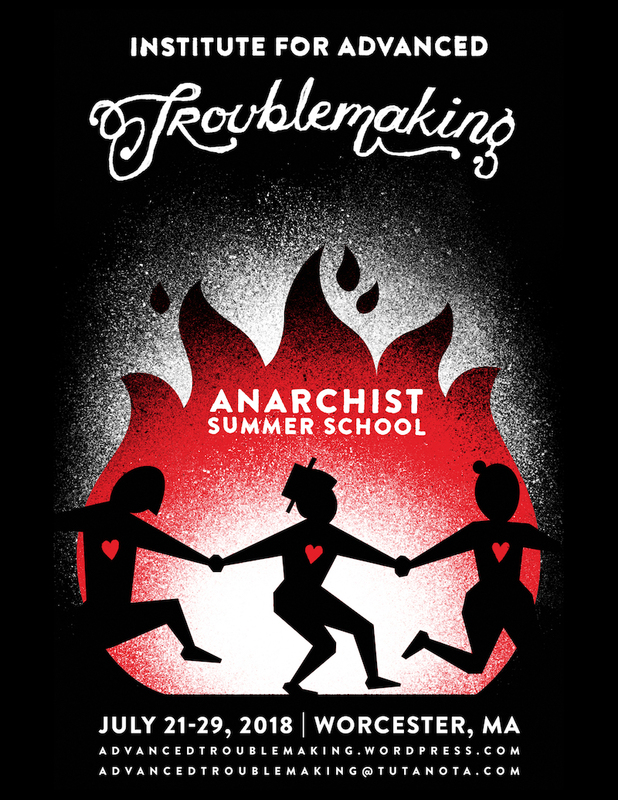 The Institute for Advanced Troublemaking, an anarchist summer school, will be held July 21st-July 29, 2018 in Worcester, MA. We are a small collective of long time anarchist organizers seeking to create a lasting movement education hub in the Northeast of the so-called US. The I.A.T. seeks to train new and old organizers alike beyond the basics in anarchist theory, anti-oppression, direct action tactics and strategic movement building. The I.A.T. aims to raise collective capacity to target our enemies at the systemic level with effective direct action and campaign work. As Trump’s presidency spurs a swell of anarchist organizing and renewed interest in anti-state anti capitalist perspectives, we want to escalate by building skills in direct action, creating movement infrastructure, and community organizing for new anarchists. We also want to bring experienced organizers together to innovate strategies and tactics for our contemporary context. Rather than an activism 101, our intention is to cultivate deeper understanding and praxis of anarchist organizing among people who are already doing some of that work. In part we are inspired by long lasting radical education projects such as the IWW associated Work People’s College (1907-1941), Movement for New Society’s ‘Life Centers’ (1971-1988), the Highlander Folk School (1932-present), and the Institute for Social Ecology (1974-present). These examples are notable largely for drawing organizers together in order to innovate tactics and strategies for their context- tools that were intentionally injected broadly into radical movement work. These longer form education projects are also notable for their alumni largely remaining life long radicals.